The mission of the UNL Programme is to develop and promote a multilingual communication platform/infrastructure, with the purpose of enabling all peoples to share information and knowledge in their native languages. To this end, the UNL Programme invites all individuals and institutions to a collective endeavor of building the UNL infrastructure of the scientific, cultural, social and economic resources generated by peoples from many different languages, and of making them available to the global community. Information of how to participate in is given at UNL website (www.undl.org) under UNL Society. The UNL Programme was launched in 1996 in the Institute of Advanced Studies (IAS) of United Nations University (UNU) in Tokyo, Japan. 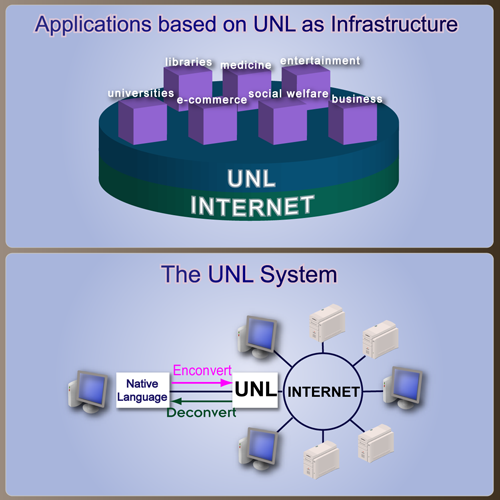 From the very beginning, a global-scale network of R&D teams, involving specialists in computer science and linguistics, have been at work creating the linguistic resources and developing the software of the UNL System. Under the direction of the UNL Center, a consortium of the university department and research institutes around the world have been developing UNL Language Centers for the respective native languages. In January 2001, the United Nations University set up an autonomous organization, the UNDL Foundation, to be responsible for the development and management of the UNL Programme. The Foundation, a non-profit international organization based in Geneva, Switzerland, with the core research and development organization UNL Center of the Foundation based in Tokyo, inherited from the UNU/IAS the mandate implementing the UNL Programme and of bringing it to fulfill its mission.